I’ll have a rummage around and dig out some of the tapes! I’d love copies of those MP3s too, as they might be better quality than I can make. I think I’ve also got a demo 4 track tape that we did after leaving Positive Records, which had quite a few new songs on it. Simon (the singer) formed another band in the late 90s called ROI, and I’ve got a CD somewhere that I’ll convert to MP3 (I’m sure Simon won’t mind). 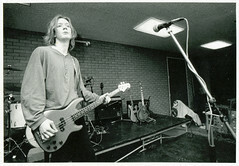 Matthew (the drummer) left the band in the early 90s to study at Hull University and joined another band (whose name I forget, but I’ll look it up). I’ve no idea what happened to Nik (the guitarist) — I think someone said he’d become a roadie for a Leeds band. The Headmen had an amicable split up after playing a gig at Bradford Queens Hall (as part of the yearly Bradford Festival) — we all wanted to go off and do other things, with Simon and myself wanting to go to university (Simon went to Nottingham Uni and I went to Huddersfield). I’m pretty sure I’ve got a box full of Headmen memorabilia somewhere, including some of the early publicity material, so I’ll have to dig that out and scan some of it in. I might even have some of the band fanzines! Ah..I had read these, I had…bhangra, mealworms..it’s all coming back to me. Christmas has blacked our all memory of things that came before it. Sorry about the double tagging. My mother-in-law was breeding mealworms to involve and excite her grandchildren. I’ve met the critters in their sawdust. We’re ickier here and breed worms. can you email me about exchanging those MP3s? Just thought I should let you know that, as long as you’re happy with the idea, The Headmen are featuring on my site at the moment. Seeing as I found this while looking up info I thought I should let you know. Errr… I was talking to my brother on the phone and we were talking about what we were doing about our respective vinyl collections (amassed during the 1980s/1990s from places like rotate in Brighouse and fourth wave and fulcrum in Huddersfield) – both of which are sat in boxes in lofts mostly unplayed since the advent of CDs and Mp3s. my brother mentioned your record ‘kissed to pieces’ which he bought aged about 16 after going to a gig. he also recalled owning a t-shirt with the headmen logo on the front which I also remember borrowing and subsequently losing after playing 5-a-side one evening at rastrick high. Anyway, I thought I would look it up on the internet and hey! here I am. thanks for the memories!!! The “Happy Shoebox” demo tape was named after the shoe shop that was opposite Fourth Wave in Huddersfield. If my memory is right, we were all in Fourth Wave browsing thru the LPs and decided to name the demo tape after the first thing we saw when we went outside. also still waiting patiently to hear the happy shoebox tape. Pingback: The Headmen » "Self-plagiarism is style"